On September 11, 1857, the Baker-Fancher emigrant wagon train was rolling through Mountain Meadows, Utah, about 35 miles southwest of Cedar City. The train was made up of several smaller parties that joined together on their journey northwest from Arkansas. Some of the emigrants were on their way to settle permanently in California; others were simply searching for greener pastures, and split off from the train when it suited them. The train rolled through Kansas and Nebraska before entering the Utah Territory, which was home to a large number of Mormons. In Cedar City, which was supposed to be the last stop before the train moved on to California, the train tried to take on supplies but the Mormons living there refused to sell to outsiders. To be fair, the Mormons had experienced a great deal of criticism, prejudice, and even violence from those who weren’t also Mormon, which is partially why they’d moved to Utah in the first place. Besides the need to keep their grain stores stocked for the coming winters, they had also been instructed by their church to hoard guns and bullets in the event that they needed to protect themselves against raiders and those who would persecute them. Plus, they were wary of selling items that might help these people who were potential enemies. The Mormons’ fears were not unjustified. After the Mormon religion was founded in the 1820s-1830s, the Mormons had been persecuted relentlessly; their own founder had been imprisoned multiple times before being killed by a mob; they had suffered massacres such as the Haun’s Mill Massacre, which had been carried out for no reason other than that they were Mormon. 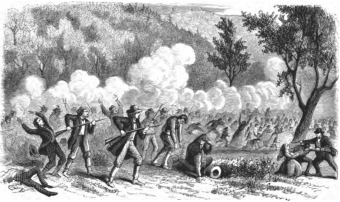 Before the massacre at Mountain Meadows, the United States Government had sent 1500 troops into Utah, frustrating the Mormons living there and raising tempers and tension. The stop in Cedar Creek was unsuccessful for the Fancher party. But that was the least of their worries. Soon, further misfortune befell them: they had drawn attention to themselves, and, as outsiders, they were seen as a threat. When the train reached Mountain Meadows, a group of Mormons attacked. Several members of the Fancher party were killed before the group was able to pull their wagons into a tight circle, for some measure of protection. The Mormons persisted, however, attacking the camp several more times while the Fancher group remained under siege, unable to continue on to California. On September 11, 1857, John D. Lee, part of the Mormon group, raised a white flag. He entered the Fancher party’s circle and asked them to lay down their guns, convincing them that there would be no more bloodshed. His group led the women and children from the circle before escorting the men out as well. Each Fancher man was escorted by an armed Mormon militia man. The group walked about a mile, after which the militiamen turned their guns to the Fancher men, shooting and killing them. A group of Native Americans then surged out of their hiding places and attacked the women and children, most of whom also perished. Exactly why the Native Americans became involved in the conflict isn’t known. It’s possible they simply wanted to decrease the number of people settling on their lands. However, there was also a story that circulated around Utah after the massacre that justified their actions. The story went that, after being denied supplies, the Fancher party deliberately poisoned a stream which resulted in the deaths of a some of the Native Americans. Most likely, the story isn’t actually true, but it’s possible that the Mormons fed this poisoning the river story to the Native Americans in order to spur them into helping to kill the Fancher party. All in all, about 120 people died for the crime of asking for some grain on their way to a new life. Only 17 children survived the raid, all of whom were then adopted by local families before being reunited with other relatives in Arkansas by the U.S. government some years later. The conflict between the federal troops and the Mormons living in Utah is often called “The Utah War” and is usually characterized as “bloodless.” However, the massacre at Mountain Meadows is almost certainly a result of that conflict, and the loss of 120 innocent lives demonstrates the war wasn’t bloodless at all. 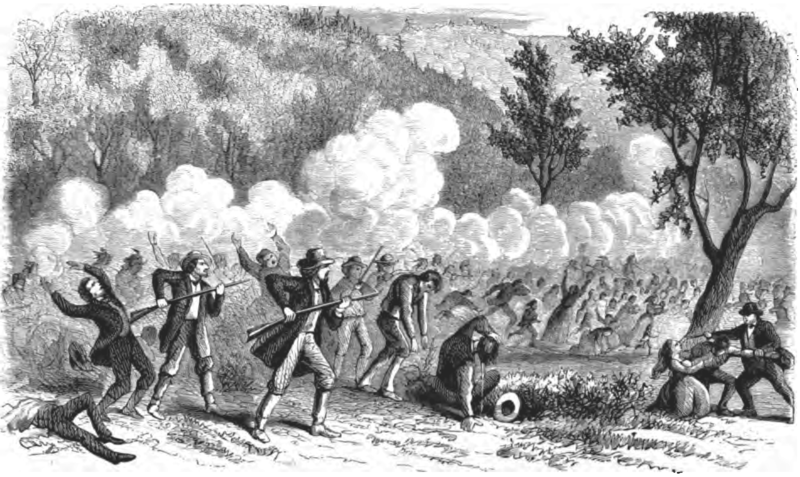 The Church of Latter-Day Saints was technically not involved in the Mountain Meadows massacre; rather, it’s thought that the Mormons at Cedar City acted alone. The church’s general attitude towards outsiders and the orders to conserve grain and ammunition likely fuelled some of the conflict, but they didn’t tell their followers to kill innocents outright. It’s difficult to have a sad event that shares the same day with another one without drawing comparisons between them. Some parallels have been drawn between the Mountain Meadows massacre and the September 11 attacks on the World Trade Center and Pentagon. Both have been attributed to religious fanaticism, though it could be argued that the Mountain Meadows massacre was less about religious fanaticism and more about extreme paranoia. The movie September Dawn was based on the events at Mountain Meadows and was released in time for the 150-year anniversary of the event. During the anniversary memorials, descendants of the victims of the attack were able to lay a wreath at the site of the massacre. They also heard from Elder Henry B. Eyring, who proposed a reconciliation with the descendants and his regrets about the suffering the attack had caused both the victims and their descendants.